We all need Vitamin D to keep our bones and muscles healthy. Trouble is we don’t get enough Vitamin D from the foods we eat. But, thankfully there’s a natural supplement: The sun. And just 20 minutes a day is enough to keep us all healthy. So why is it that in UAE - the 6th sunniest country on earth (somewhere that gets an average of 9.9 hours of bright sunshine a day, an estimated 80% of the population is Vitamin D deficient? And hence, are undergoing or will undergo the potential threat of suffering from bone and muscle-related health problems caused due to lack of Vitamin D? It’s a problem that costs Daman (the leading health insurance brand in the UAE) approximately millions of AED a year, as every year thousands of people are being prescribed costly and completely unnecessary Vitamin D tests. And will continue to cost Daman as more people are treated for issues stemming from Vitamin D deficiency. FP7/McCann in Dubai needed to educate people about the importance of Vitamin D as well as getting them to step out into the sun, including during the hot summer months. Our solution: We reminded people that the solution to Vitamin D deficiency was as simple as getting a little more sunshine. 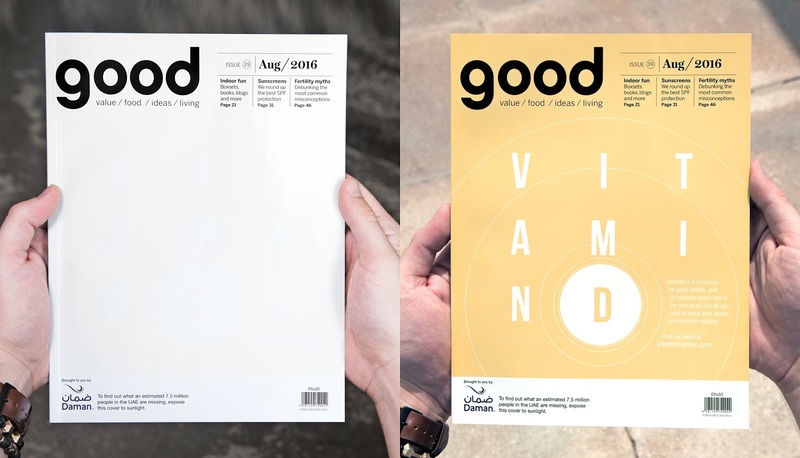 So, over the summer months, we created a series of magazine covers across the UAE’s leading editorials, that could only be read once people stepped outside into the sun! The reactions and responses have been very positive and Daman is actively monitoring the impact of people stepping into the sun. Idea: AdD - A Print Ad that gave people in the UAE some much needed Vitamin D.